One does not discover the absurd without being tempted to write a manual of happiness. "What! — by such narrow ways — ?" There is but one world, however. Happiness and the absurd are two sons of the same earth. They are inseparable. It would be a mistake to say that happiness necessarily springs from the absurd. discovery. It happens as well that the felling of the absurd springs from happiness. "I conclude that all is well," says Edipus, and that remark is sacred. It echoes in the wild and limited universe of man. It teaches that all is not, has not been, exhausted. It drives out of this world a god who had come into it with dissatisfaction and a preference for futile suffering. It makes of fate a human matter, which must be settled among men. 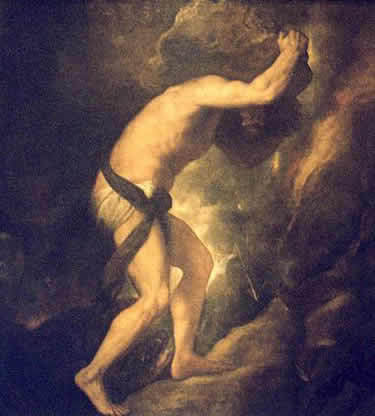 All Sisyphus' silent joy is contained therein. His fate belongs to him. His rock is a thing Likewise, the absurd man, when he contemplates his torment, silences all the idols. In the universe suddenly restored to its silence, the myriad wondering little voices of the earth rise up. Unconscious, secret calls, invitations from all the faces, they are the necessary reverse and price of victory. There is no sun without shadow, and it is essential to know the night. The absurd man says yes and his efforts will henceforth be unceasing. If there is a personal fate, there is no higher destiny, or at least there is, but one which he concludes is inevitable and despicable. For the rest, he knows himself to be the master of his days. At that subtle moment when man glances backward over his life, Sisyphus returning toward his rock, in that slight pivoting he contemplates that series of unrelated actions which become his fate, created by him, combined under his memory's eye and soon sealed by his death. Thus, convinced of the wholly human origin of all that is human, a blind man eager to see who knows that the night has no end, he is still on the go. The rock is still rolling.